If you plan it, you can cut winter short. You can order spring to come to your house 8 to 12 weeks early. Do this simply by adopting the florists’ methods of forcing tulips, daffodils, and hyacinths into bloom weeks ahead of normal season outdoors. Buy your bulbs in the fall. 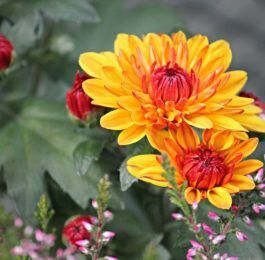 Keep them dry and in a cool spot between 40 and 50 degrees-until planted. Usually, the earlier they’re planted, the earlier they’ll bloom. Buy top-quality bulbs and select varieties of tulips, daffodils, and hyacinths that are recommended for forcing. Your garden center will help you. Single sorts are best for forcing. All indoor bulbs are not grown in the same way. Some, such as tulips and daffodils, require a period of 8 to 10 weeks in cold storage before they are brought into the house. This may be provided by sinking the potted bulbs in an 18-inch trench in the garden and covering each pot with an inverted one, and heap the pot with ashes to discourage worms. If you conduct the task in the house, a cool temperature will open subsequent buds to their full beauty. The tender bulbs do not require this freezing treatment, but most of them need a few weeks in a dark, cool place for root formation. When growth is evident, they should be moved to a lighter and warmer location. Use good topsoil in your containers. If planting one without a drainage hole, you’ll need to be careful about overwatering while the bulbs are forming their roots. Clay flowerpots, glazed bowls, tin boxes, even paraffined cheese cartons can be used. But nothing less than 5 inches deep for the big bulbs, please, because when they begin to grow they “stand up on their roots.” The tips of the bulbs need not be covered with more than 1/2 to 1 inch of soil. Tulips, hyacinths, and daffodils can be spaced as close as 1 inch apart. 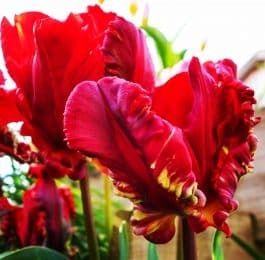 This means you can have six good-size tulip bulbs or three large hyacinth or daffodil bulbs in a 6-inch pot and get a grand blaze of color. Darkness, moisture, and coolness are the three essentials while the roots are being formed. Keep your potted bulbs moist and in some spot where the temperature stays below 40 degrees, and you’ll get good root systems. Water the bulbs well when you plant them. Cellar or basement is the recommended place to keep them while they are developing roots. It is likely to be most convenient, and the general conditions there are most favorable to the bulbs at this stage of their existence. A trench in the ground covered with boards will give good results, too, providing the necessary degree of coolness is secured. Remove bulbs put out of doors to form roots to some place free from hard frost before freezing weather sets in. Slight freezing doesn’t hurt them; hard freezing does. 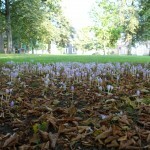 It is not harmful to bulbs in the ground because its effects are overcome naturally and gradually. Roots must come first. 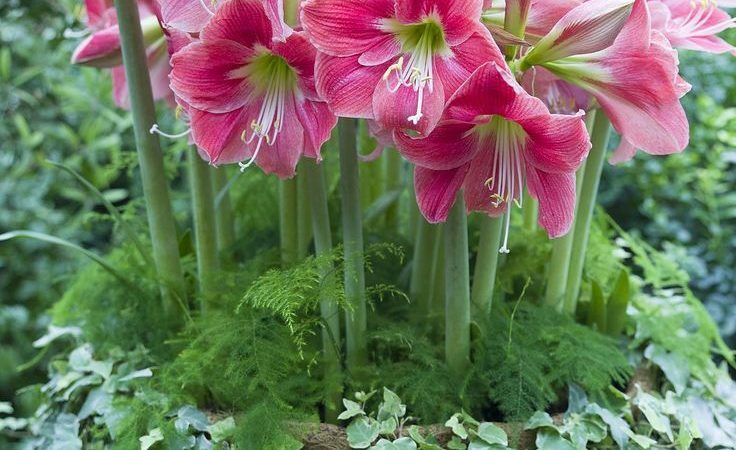 With these bulbs, the bloom buds are already formed when you buy them. Whether or not the blooms emerge in perfect form depends on the support they get from good root systems. Examine your pots for progress after several weeks in their cool, dark spot. If you hold your hand across the top, you can turn the pot on its side and let the soil slip far enough for you to see whether the pot is filling, or just starting to fill, with white roots. Of the three big bulbs, hyacinths are the trickiest. Hyacinth bloom buds should have come up far enough to show in the heart of the leaf rosette before you bring the pots into the light. 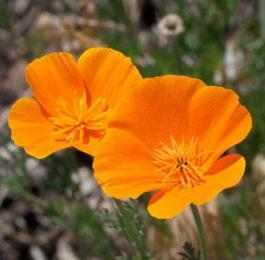 With most kinds, better wait until the top of the bud spikes are 2 inches above the soil. When buds are up, bring the pots into the light for two days, but still keep them as cool as possible-certainly under 60 degrees. On the third day, promote them to prominent and sunny spots in your windows. Potted bulbs must never be allowed to dry out. 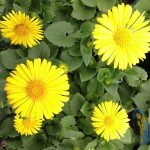 Constant moisture at their roots will not only promote good growth but prolong the life of the flowers after they open. Your hyacinths, tulips, daffodils, crocuses, and grape-hyacinths can be saved for planting in the garden. Care for them as you do any other house plant until mid-April when they can be slipped with root balls undisturbed into garden soil. Some bulbs will skip a year before blooming, yet all will flower again. But buy new bulbs for forcing indoors this way next year.